As we were leaving Digoin, and just thinking of stopping at a little port, we saw some Canadian friends (David and Liz) coming towards us. We first met them 5 years ago when we were doing this same cruise in the other direction. They are always good company and, as luck would have it, we managed a nice lunch with them and caught up with all the latest news. Particularly Liz's beautiful artworks, which just get better and better. Moving on we eventually got to the summit of the Nivernais canal at Lac Baye. 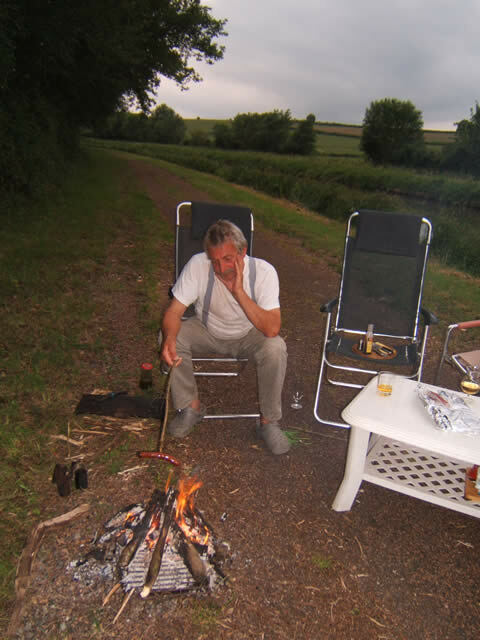 We moored here overnight and barbequed then, as Liz and David would have done, we sat around the campfire and just relaxed. 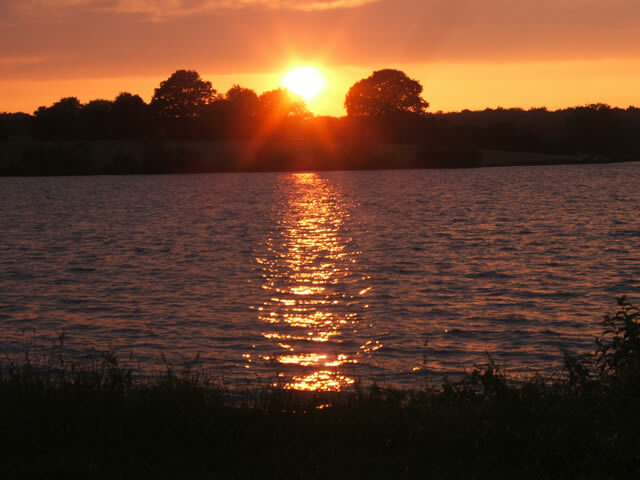 It was a very nice end to the day. As we had a major woodworking project this year, we tried to moor where we wouldn't make a nuisance of ourselves and where Gromit might find safe places to walk away from the laptop perhaps! Our next photo is of such a place where the path didn't really go anywhere. In fact in the 3 days we were there just 1 tractor passed and never came back whilst we were there. Of course boats pass but their numbers can be counted on one hand in this part of France. 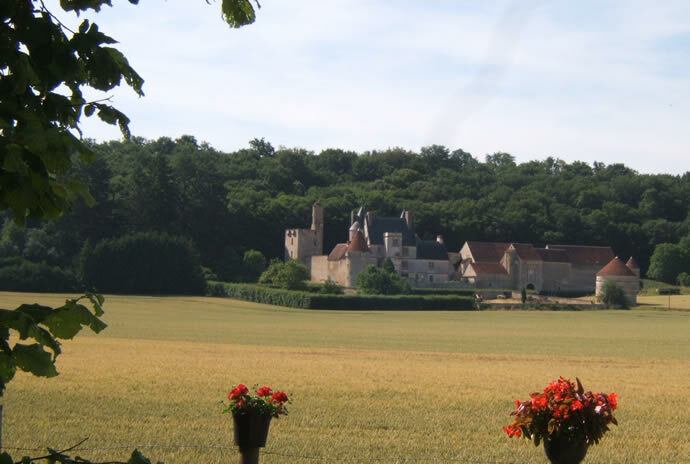 Our next stop was at Chatillon en Bazois, well known as the place where Chris Matthew used to look after the port. Chris's father is the famous British DJ Brian Matthew who still has a Saturday slot on BBC Radio 2. What a wonderful speaking voice Brian Matthew has, in the same vein as James Mason and Alistair Cooke. 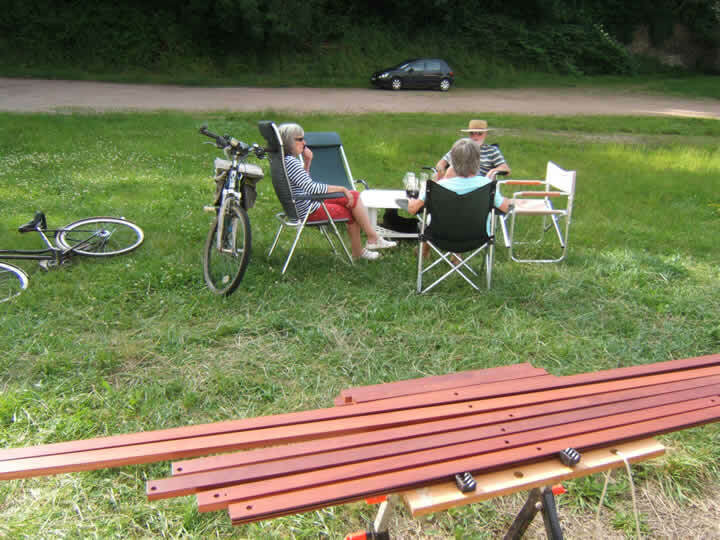 All the woodworking we had done in the secluded parts of the canal were varnished at Chatillon and, of course, you have to find something else to do whilst waiting for the drying process. 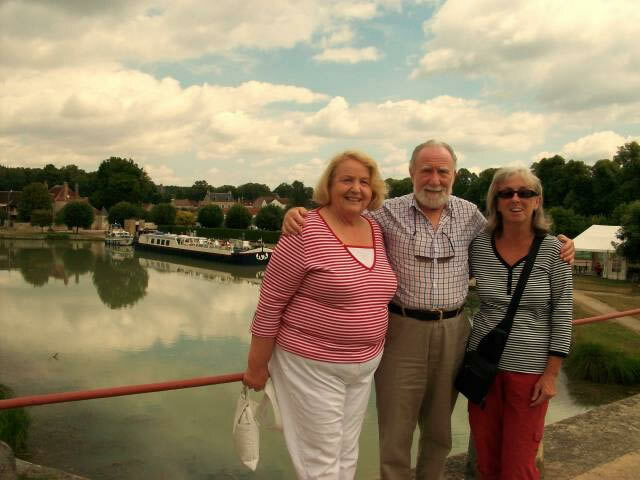 It was here that we met David and Mary of HENDRIKA, a boat we had seen in Saint Jean de Losne. So an aperitif seemed the perfect solution. 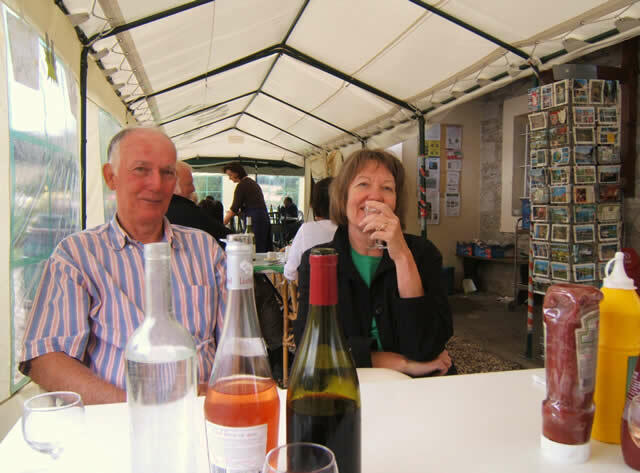 It was soon time to leave Chatillon, as we needed to get to Clamecy for our friend Richard's arrival from England. Just before the port of Clamecy, there is a new port that has never got off the ground so to speak. It was to be a holiday complex with chalets and boat hire but nothing has changed here since our first visit in 2005. It seemed out of place at the time but now we think differently and it does seem a great shame. We went for a walk around the site and managed to get lost in the large wooded area. It was quite unspoilt and we did see a red deer with her youngster (too quick to photograph). 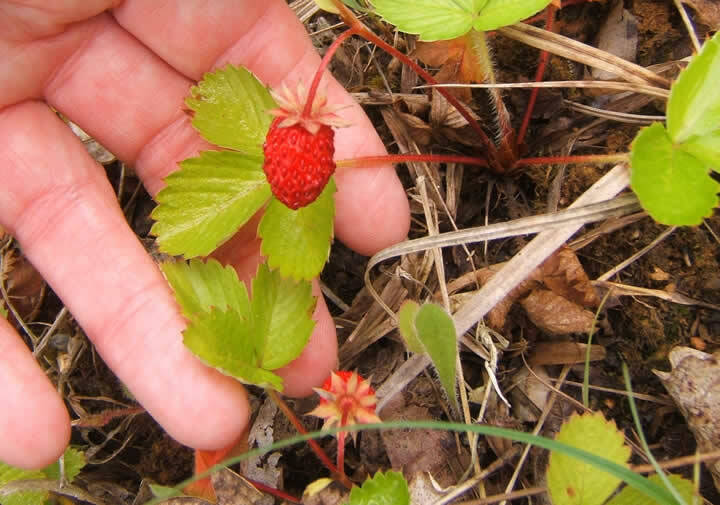 But we did capture these brilliant wild strawberries, which tasted fantastic. 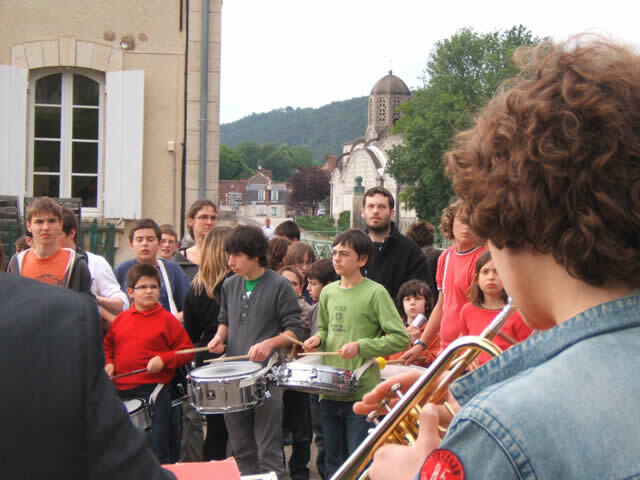 We arrived at Clamecy just before Midsummer and music practice was in full swing at the port. 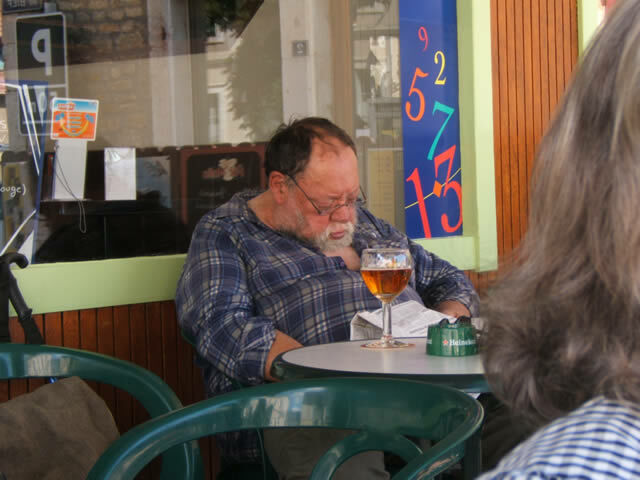 Our friend Richard arrived after a long drive and on a route which took him quite close to the centre of a manic Paris. A different route home I'm sure. 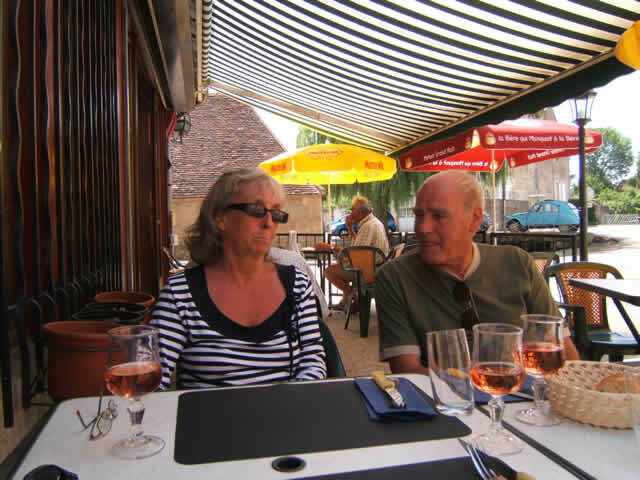 More friends, Pat and John of HODDY DOD, had been in touch and, travelling in the opposite direction, we knew Clamecy was to be the meeting place. So everyone's favourite "Roast Lamb" was the order of the day. A barmy evening meal on the quay was the venue and went on until well into the night. We even had a complaint from some boater across the quay that we were very loud!! (joking we hope) Was he annoyed that he didn't get an invite? Or do we still know how to party? Maybe both. 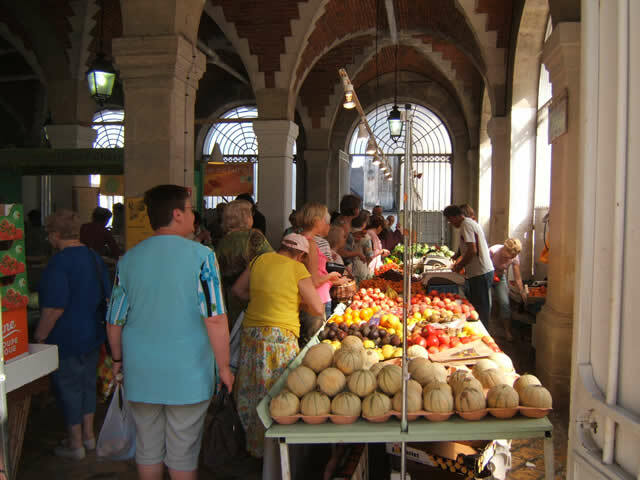 You can't miss the indoor food markets in France, if they are open that is. There is lots of wonderful fresh food and a new discovery for us of salted lemons. I had read of them and seen them on Saturday Kitchen. I think they are of Italian origin, but certainly Mediterranean. We have tried them on salads, in casseroles and when cooking potatoes - excellent! Maybe we will have to salt our own this winter, as we haven't seen them anywhere else. phew! It calls for something to quench your thirst as you can imagine. 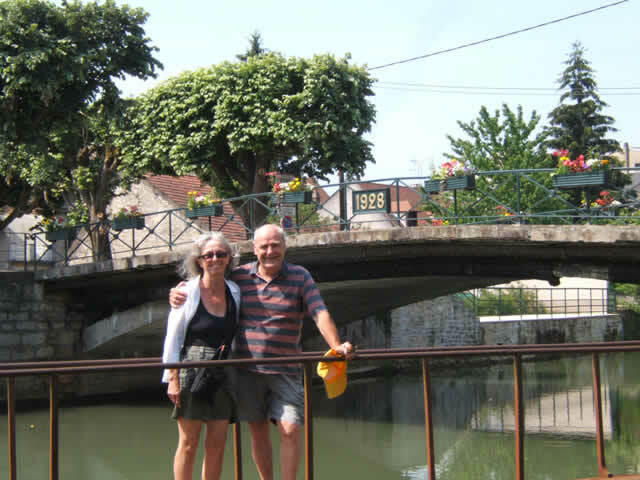 Whilst in Clamecy, Richard kindly offered to take us away from the canal to visit another village called Vezelay. It was a place we really wanted to see and it was only about 25 minutes by car. Vezelay is set high upon a hill and, without sounding as though we have just swallowed a travel guide, it is very famous throughout the land. Its most famous claim to fame is that the 2nd Crusade started here and we all know what trouble that caused!
. if things hadn't changed, we might still be wearing biblical garb, chopping off heads, stoning people, starving and wanting handouts. 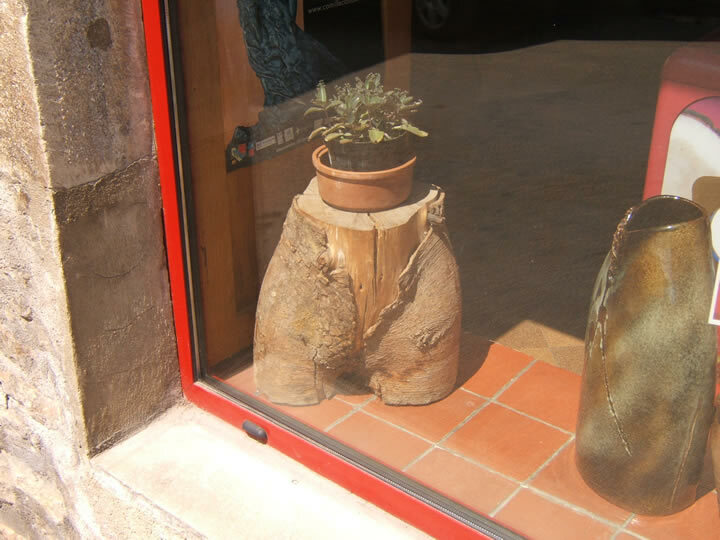 Anyway, as we walked up to the top of the village to see the famous Basilica, we spotted 2 different shops on 2 different streets, with a very similar window display. Very strange!!!!! The chap in the next picture seems to be getting a little overheated with nowhere to hide. I don't suppose France is any different to the rest of the world when it comes to finding a way to break the rules. Like parking for the disabled for example. If they park in a disabled bay in the supermarket, the least they should do is pretend to have a problem with walking. 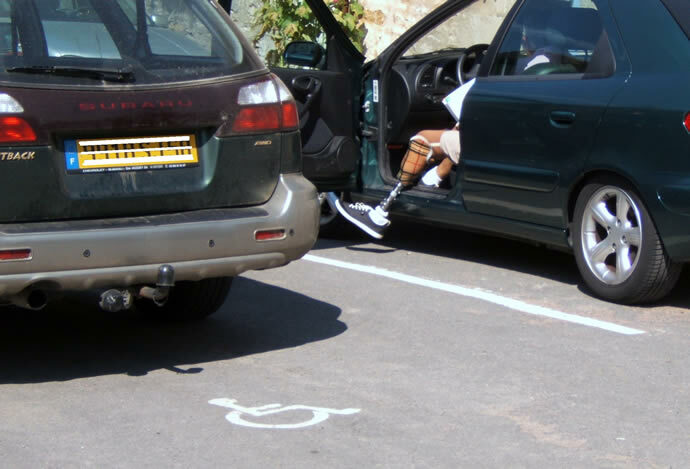 But no, they flaunt the rules and care not as to who might actually need the parking spot.
. or was he guilty? Who knows? 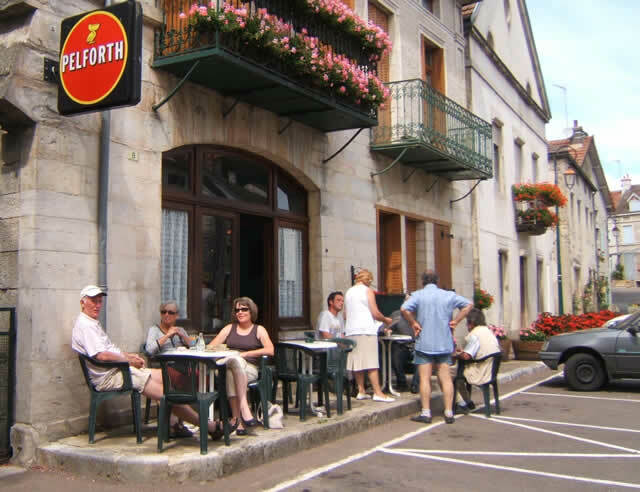 Leaving Vezelay, we found a nice little roadside café serving a simple lunch menu. 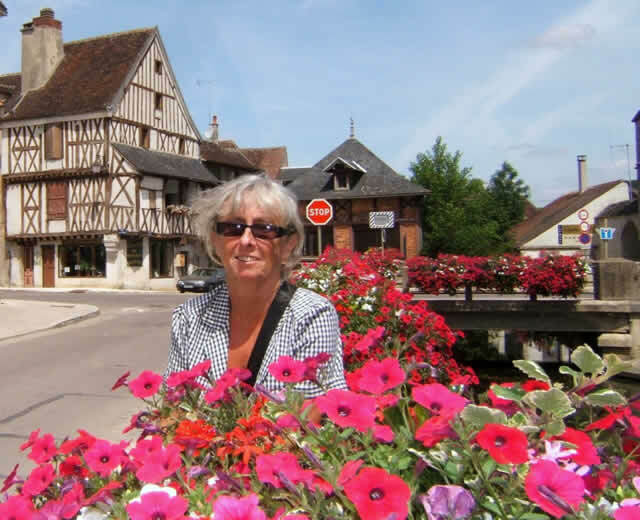 Moving on towards Auxerre, we arrived at the village of Chatel Censoir. The last lock before we arrived is one of the prettiest. We did however give the gates a bit of a clonk on the way in and had our details taken. Nothing heard yet so maybe a little cement sorted it out. Whilst we were at Chatel Censoir we thought it was time to get the lifeboat down and check it out. The evacuation drill went as planned so we went for a little trip towards the last lock. Up in the village all was quiet, so time for another cool beer. Maybe this chap had more than one? 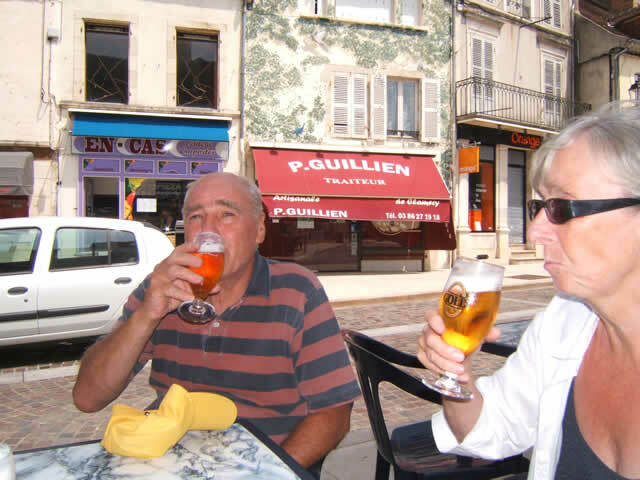 After we arrived in Auxerre, Richard and I decided to get the train back to Clamecy to collect his car. 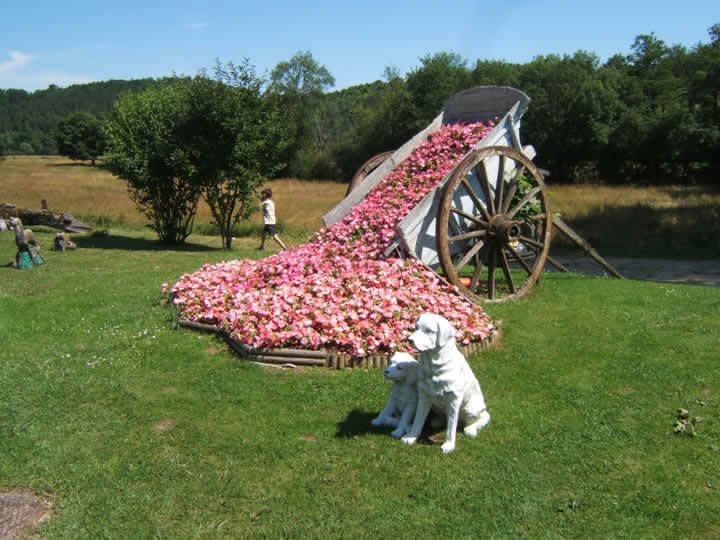 That allowed us to go on another trip, this time up to the famous wine village of Chablis. 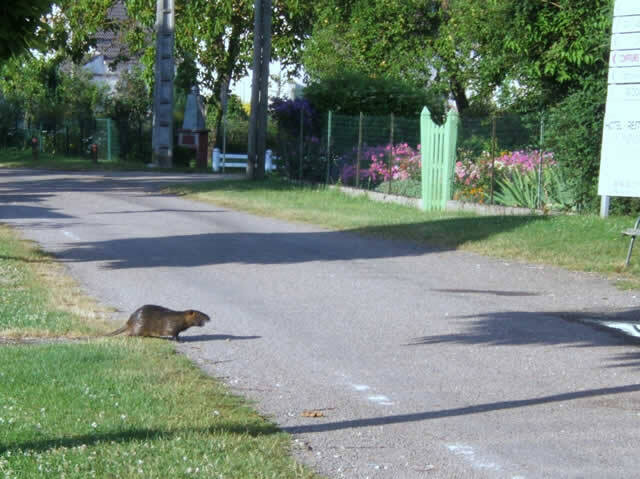 Whilst we were still on the river Yonne, we spotted this Coypu - similar to a beaver, but without the flat tail. They are vegetarians who normally forage at night and later that night, a family of them arrived by the boat. Father, mother and 3 young ones. They didn't seem to mind us getting quite close either. 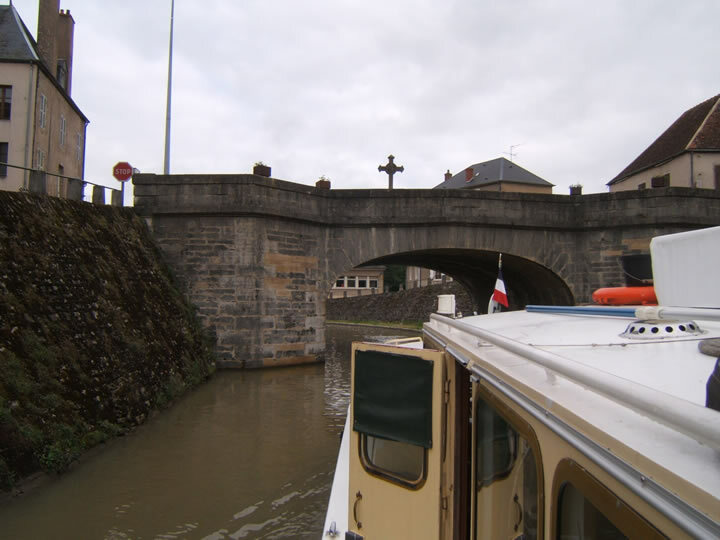 It was soon time to be heading onto the Bourgogne canal so that we could receive our next visitors. It had been quite a while since we had seen Renate and our get together was long overdue. 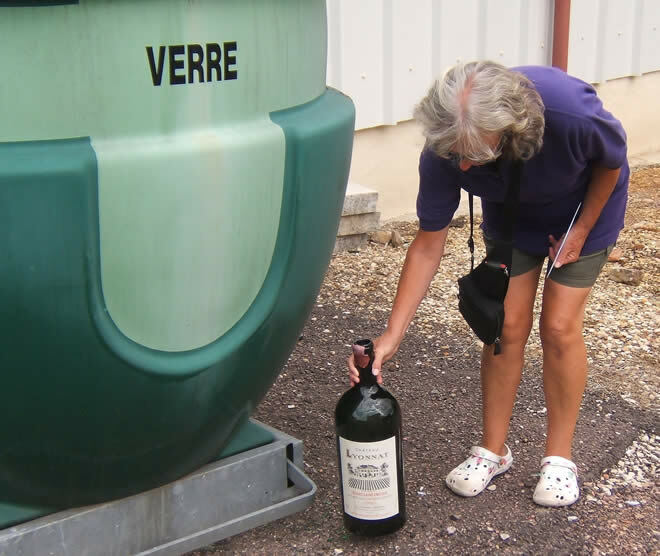 We arrived at Ancy le Franc in good time and that gave us time to restock and get ready. 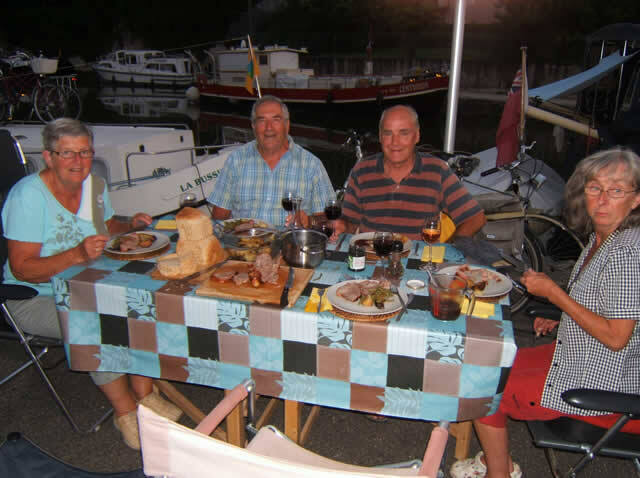 We planned to take a cruise with them down to Tonnerre and luckily the weather cooled down so that made the trip much more comfortable for them. It was great to have some extra matelots on board (not that there is much to do as the lock keepers do most of the work round here). Our next picture was taken at Tanlay, another very pretty village. Far too quickly we were heading back to where Renate and Jim had joined us and it was time to say our goodbyes. 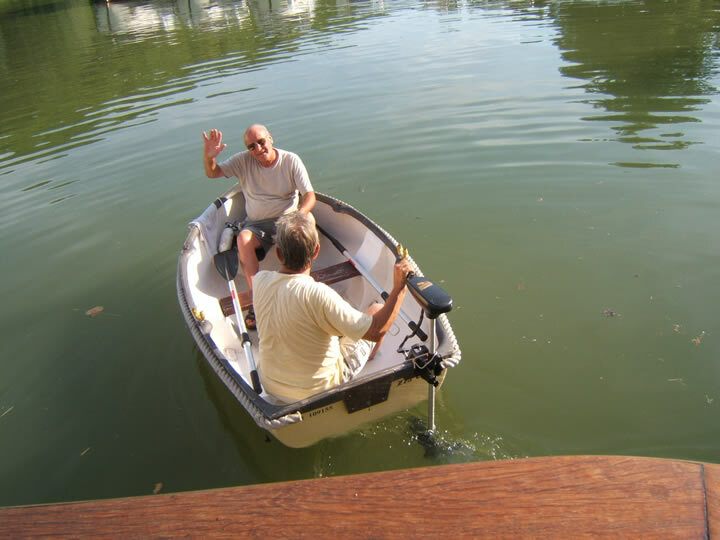 It was the first time we had met Jim and he thoroughly enjoyed his time on board. What a genuinely friendly man - they make a great couple. A little further along the canal, we just happened to bump into our good friends Jean-Pierre and Ilse. They were steaming back to St. Jean de Losne as they had an appointment to keep. But we did manage to have an evening together and catch up on developments at their house. Apparently the platform we made during the spring for their boat was working well and "much admired" by other boaters. We are not exactly sure of where the fortified farm in our next photo actually is. But we think it is between Vandenesse and Pont d'Ouche, as we have seen it many times before. Our friends Bryan and Jill came to see us at Pont d'Ouche and brought some supplies from Blighty. Again, lots of catching up, gossip etc. best done over a meal at Chez Bryony's. Bryan and Jill stayed over and we were all lucky enough to catch an annual Brocante (Antique Fair) at the village of Mont Saint Jean, about 30 minutes drive away. Almost single track road all the way into the village but well worth it when we arrived. The village is very old, with lots of history and an amazing old hospital. A place for us to visit during the winter we think, on a clear sunny day. 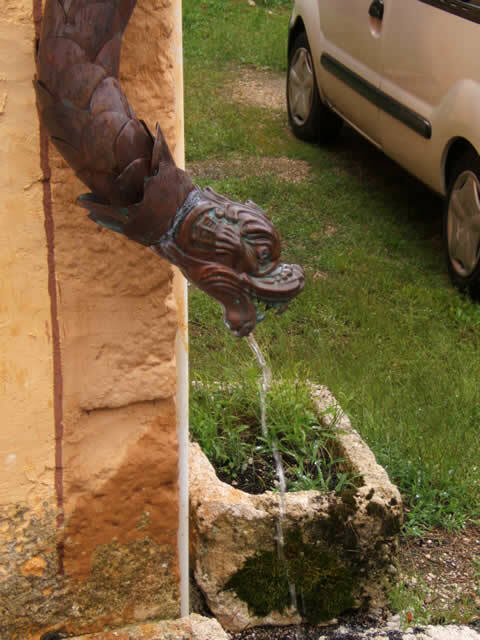 This next picture is of a down spout/fall pipe (call it what you will) in Mont Saint Jean and needed the rain to show it off at its best (all in copper of course). 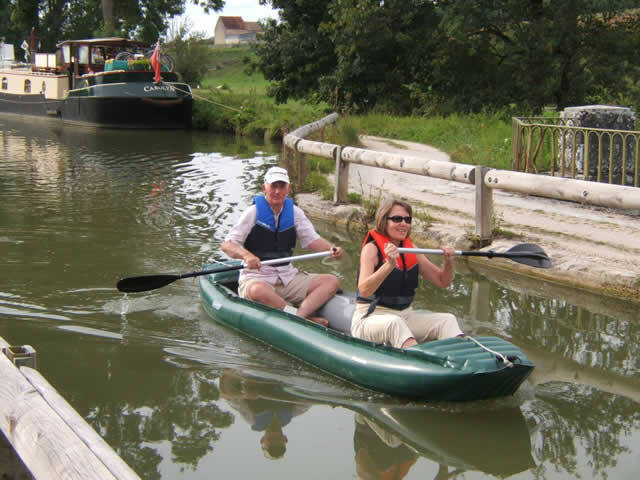 Back at Pont d'Ouche and Bryan and Jill tried out their latest purchase - an inflatable canoe. On another little trip we stumbled across a hilltop village and decided to have a coffee. "4 large white coffees please" we said (in our finest French of course) only to be told by the owner that she had no milk! It's been a very busy season for us this year and someone once said to us "I know too many people". "Yes, we do too, but they do make life much more interesting, even if it means you have to spread yourselves out a little thinner"
So, we are sorry if we haven't seen you or been in contact for a while. We're sure we will catch up again soon. On a final note, and in deference to all in Gromit's fan club, we simply couldn't do an update without including a photo of the great cat himself! It was taken when Gromit met this dog from a hotel boat. At first, we weren't sure how things would go. 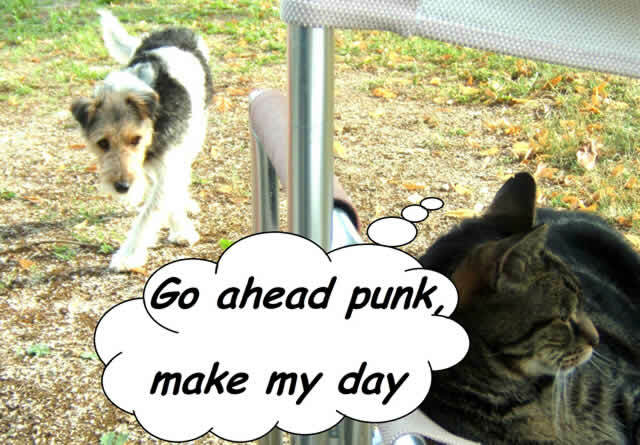 But when Gromit stood his ground and the dog realised that Gromit wasn't afraid of him, there was no problem. In fact the dog became very good at running away!